Siena keeps creating her next chapter. 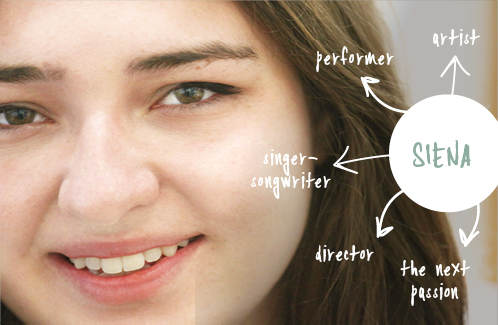 Siena is an artist, musician, singer-songwriter, performer, actor, director, and now Stanford freshman. The only question for her is, what's next? Siena started off on the shy side. "I almost refused to run my first Jog-a-Thon in kindergarten because the idea of running in front of people seemed overwhelming. My first love was visual arts, which is strange now considering how introverted the process is compared to performing. In 6th grade I started playing the guitar, and soon I started writing songs and singing. In 8th grade I got a part in Alice in Wonderland, and in 9th grade I performed in Rent. The biggest gift has been being part of a group of kids who loved the performing arts, but are also into things like math, literature, and science." She thrives in the space between structure and creativity. 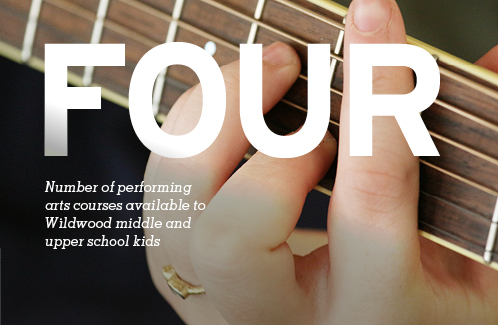 When Siena entered the upper school, she signed up for a singer/songwriter class. More than pure creative exploration, the class built bridges between songwriting and what she was learning in other classes. Her history class helped her appreciate the power of ideas to move people to action. Her liteature class gave her different frameworks for expressing herself. "Wildwood gives you this perfect amount of freedom—there's structure, but within that structure you are in charge of your learning." "The most valuable thing I learned was that putting 100% of myself into my work produces all kinds of unexpected rewards."